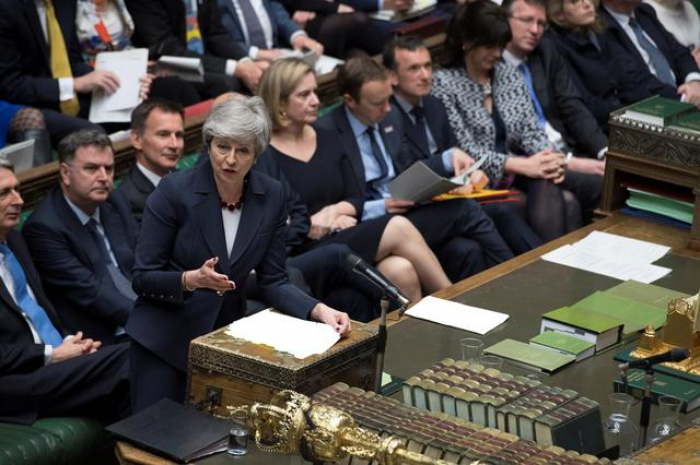 British Prime Minister Theresa May failed to sway hardline opponents of her European Union divorce deal on Wednesday with an offer to quit, but parliament’s bid to agree an alternative fell short, leaving the Brexit process as deadlocked as ever, Reuters reports. May told her Conservative lawmakers she would step down if her Brexit deal was finally passed by parliament at the third attempt, in a last-ditch bid to win over many of her party’s eurosceptic rebels. But some were unmoved and the Northern Irish party crucial to getting the agreement through said it would reject the deal again. Britain was supposed to leave the bloc on Friday but Brussels agreed last week to put back the divorce date until April 12 to give it a chance to resolve a three-year crisis that has split the country down the middle. However, it still remains uncertain how, when or even whether the United Kingdom, the world’s fifth-biggest economy, will leave the EU. The possibilities that it will leave with no deal to soften the shock to its economy, or delay the departure date to hold a general election, have increased as other options fade. While May’s deal continued to stumble, an attempt by parliament to take control of the process by holding a series of indicative votes on other options produced no immediate way through the impasse. None of the proposals, many of which involved closer alignment with the EU than May envisages, won the support of a majority of lawmakers. “In a spectacular display of indecision, the House of Commons has voted against remaining in the EU and every version of leaving the EU,” tweeted James Cleverly, the Conservative Party’s deputy chairman. Nevertheless, some proposals fared better than May’s deal had done two weeks ago, and parliament was due to hold more indicative votes on Monday after refining the options most likely to secure a majority. Many Conservative eurosceptics had made clear they would only consider supporting May’s deal if she gave a firm commitment to resign, hoping a new leader would be more sympathetic to their views when negotiating the terms of Britain’s future relationship with the EU. But within hours of May’s offer, the Democratic Unionist Party, which props up her minority government, said it would vote against the deal if May brought it back a third time. “We’re in a situation where we cannot sign up to the Withdrawal Agreement,” DUP leader Arlene Foster said. The government gave itself the option of bringing May’s deal back to parliament on Friday, although speaker John Bercow repeated his warning that he would not allow a third vote unless the motion had changed substantially since its last defeat. Her deal, defeated in parliament by 149 votes on March 12 and by 230 votes on Jan. 15, means Britain would leave the EU single market and customs union as well as EU political bodies. But it requires some EU rules to apply unless ways can be found in the future to ensure no border posts need to be rebuilt between British-ruled Northern Ireland and EU member Ireland. While May was addressing her lawmakers, MPs in the main chamber debated eight other Brexit options, ranging from leaving abruptly with no deal to revoking the divorce altogether. While there was no majority support for any, the option calling for a referendum on any departure deal, and another suggesting a UK-wide customs union with the EU, won more votes than May’s deal did two weeks ago. Oliver Letwin, a Conservative former cabinet minister who led parliament’s unusual power grab, said it had been expected that none would immediately win a majority, and lawmakers would have another chance on Monday. The uncertainty around Britain’s most significant political and economic change since World War Two has left allies and investors aghast. Sterling dipped after Wednesday’s events. She would also become the fourth Conservative prime minister in a row to have fallen foul of divisions over Europe within her centuries-old party, following David Cameron, John Major and Margaret Thatcher. Most voters think the Brexit negotiation has been handled badly and there may now be a slight majority for staying in the EU, recent polls suggest. Many Conservative MPs say May herself has caused the chaos by not negotiating harder with the EU.